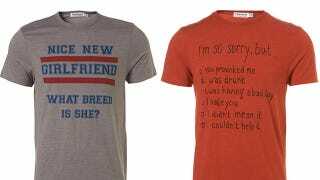 We can only assume that when the internet caught wind of the offensive Topman t-shirts that implied women look like dogs and perhaps made excuses for domestic violence, the Customer Service department became inundated with complaints. Reader Pia sent us the apology she received from the company, which stated that the shirts were "in no way meant to make light of any sort of violence" and suggested they were "meant to be light hearted without carrying any serious meaning." You can read the letter in full, below. Thank you for your email received 14 September 2011, regarding the ‘I'm So Sorry' and ‘New Girlfriend' T-shirts. I was extremely concerned to note your comments on the designs that are on these T-shirts, and would like to offer my sincere apologies on behalf of Topman for the obvious upset these particular garments have caused you. Topman stock T-shirts with various designs on them, and by featuring these designs we certainly did not mean to cause offence to our customers or any members of the public. Please accept my assurances that these images were in no way meant to make light of any sort of violence and were instead meant to be light hearted without carrying any serious meaning. I have passed a copy of your email to our Buying Director, so that he is aware of how strongly you feel about this issue. We are proud of our reputation as a retailer, and do not want to risk damaging this by causing any unnecessary upset to anyone. He has confirmed that the decision has been made to remove these T-shirts from online and in store. I am grateful you have taken the time to bring your concerns to our attention, and once again apologise for the upset these T-shirts have caused you. While the above apology doesn't make up for Topman selling the shirts in the first place, it's marginally less soul-crushing to see a company to own up to the offense.